A bold reddish orange, sunset kiss is the perfect shade to inject a bit of colour to your manicure. From Irish fashion and beauty blogger Suzanne Jackson (SoSuMe.ie) it’s rich & creamy and with a wide brush, it’s the ultimate streak free gel polish. 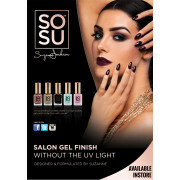 No UV lamp needed - apply in 3 strokes, one left, one right, and finish in the centre of the nail for flawless coverage, and finish with SoSu’s top coat for chip free nails for up to 7days!